The World Baseball Classic may be behind us, but the tournament lives on through 2013 Topps Tribute World Baseball Classic Edition. Sticking with the brand's high-end appeal, the hit-per-pack product includes four autographs and two numbered patch cards in every box. 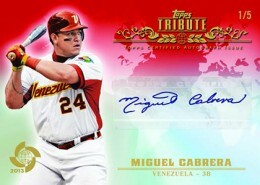 The 2013 Topps Tribute World Baseball Classic Edition base set has 100 cards. Bringing together players from several countries, it has an international flavor to it. While there are lots of major league stars, there's also a prospecting element to it as some of the players may one day find themselves in the big leagues. Yu Darvish and Yoenis Cespedes are proof of that from the last World Baseball Classic. Base cards have three parallels: Gold (#/25), Red (#/5) and Purple (1/1). Autographs come from more than 50 players including David Wright, Miguel Cabrera, Adam Jones and R.A. Dickey. Parallels include Blue (#/50), Sepia (#/35), Orange (#/25), Gold (#/15), Red (#/5), Onyx (1/1) and Purple (1/1). Besides the most recent tournament, 2013 Topps Tribute World Baseball Classic Edition reaches back to include signatures from standouts in the first two tournaments. World Baseball Classic Heroes Autographs features Darvish, Cesepedes and more. The set takes it a step further playing "What If?" with Tribute to the International Legends Autographs, with signatures from retired stars who may have played in the World Baseball Classic if it existed back in the day. Whatever the reason is needed to get Cal Ripken, Nolan Ryan and Don Mattingly autographs in a product, it's unlikely many collectors are going to complain. It is worth noting that early mock-ups show that autograph cards use stickers. World Baseball Classic Prime Patches lead the memorabilia hunt, featuring pieces of game-used WBC patches. Besides basic numbered versions, there are seven parallels. None of these parallels have a print run higher than 50. Flag Patch and Logo Patch cards are one-of-ones that come with complete patches. 2013 Topps Tribute World Baseball Classic Edition also has redemptions for full jerseys used in the 2009 tournament. Prior to the release of 2013 Topps Tribute World Baseball Classic Edition, the card maker acknowledged a couple of printing errors. Boxes state that every pack has autographs numbered to 99 or less. As originally announced, base autographs are not numbered. Boxes also have two patch cards, not one as stated on the box. These patch cards are numbered to 99 or less. Also, seven players have two autographs that are identical except for the card number. These players are Jose Berrios, Jason Grilli, Kelvin Herrera, Luis Mendoza, Miguel Montero, Salvador Perez and Carlos Santana. These apply to both base autographs and parallels. Good: International appeal. Mix of prospects and major league stars. One hit per pack. Bad: Lack of value. Poor collation. The Bottom Line:2013 Topps Tribute Wold Baseball Classic has some nice appeal to the international collector but not nearly as much for major league collectors. There are lots of hits with one in each pack, but this is also a high-end product. These include a lot of nice colored patches as well as prime flag patches. There is some potential for hitting a nice autograph of legends like Cal Ripken and Hank Aaron. That said, they're extremely tough to find. Cards are printed on a thick card stock. They come with a glossy background that nicely showcases a world map. A gold border gives the cards a nice classy feel. The autographs have a very similar feel to the base with the exception of the gold border. The game-used are probably the nicest surprise in the product. I'm not sure if all of them are this way, but the two we pulled were very nice multi-colored patches. These cards also had a different background. They have longitudinal lines similar to those on a globe. Tying them into the feel of the product. It seems that the uniforms of the WBC are much more colorful and they make for some pretty sweet patch cards. The checklist is decent. There are some big names, but there are also a lot of lesser-known players. They come from all parts of the world including Japan, the Dominican Republic and, of coure, the USA, to name a few. This means cards of players that might not otherwise be available for MLB products. There are some very nice veteran autographs of players such as Willie Mays and Nolan Ryan, but are extremely hard to pull. The base set is small with only 100 players included. There are a different number of patch variations and autograph variations as well. Multiple base parallels add to the diversity in the set. 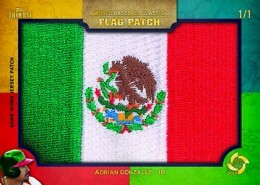 The Logo Patch and Flag Patch cards give a chance at one-of-one cards from many of the WBC participants. There is the potential to hit some very huge autographs and logo patches, but they are few and far between. With the absence of any base parallels in the box, it seems the collation of the product is not the best. After looking at the value on the open market, the base autographs do not seem to carry a lot of value. One might get absolutely creamed if it came to trying to get their money back on any given box. Busting high-end products can be a lot of fun. 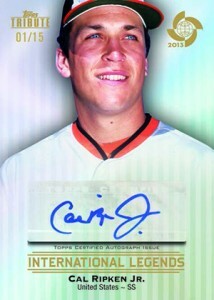 2013 Topps Tribute WBC Edition does not disappoint in this regard. The cards are visually appealing. There is also some potential of pulling some very high-end autographs. With each pack containing a, autograph or patch card, every pack should have something decent. But the high price tag also means there is a ton of risk. Man looks like a good set! Like the color! How much will a pack cost? Overall, this product has the BEST quality jersey cards I’ve ever seen from any product at any price point. Every jersey/relic cards was a multi color patch. That in and of itself deserves a tip of the hat to Topps. I’ve always liked WBC related cards and think this is a great way to provide collectors with some premium card options, whereas past WBC products have been largely low end offerings and afterthoughts. Take it for what it is – a WBC product NOT a MLB product. If you are a WBC fan this is a great buy. If you are looking to secure some big hits of your favorite MLB player of the past or present then it’s best to take a pass on this one. With the 2014 season coming on, this set from last year was one of the better products Topp’s put out. decent patch cards, nice auto’s, and a few sleeper cards, plus getting 4 auto’s per box doesn’t hurt. The price has really come down on this one and with who and what is in the set, I believe it gives a lot of bang for the buck. I just pulled the redemption for the full jersey!! Would be curious as to how many there are of them. I strictly collect WBC cards so i might be a little biased. I found that the 2013 Topps Tribute set was better than 2014,15,16 The Color was outstanding, clarity outstanding, and just the card it self was super. Not flimsy card board. I think Topps did well for 2013. 2013 Topps Tribute Baseball WBC Edition Hobby Box - Factory Sealed!